Never before have I jumped on a MAC limited edition launch bandwagon. Yes I like their products, but for some reason, none have really grabbed me before, until now. 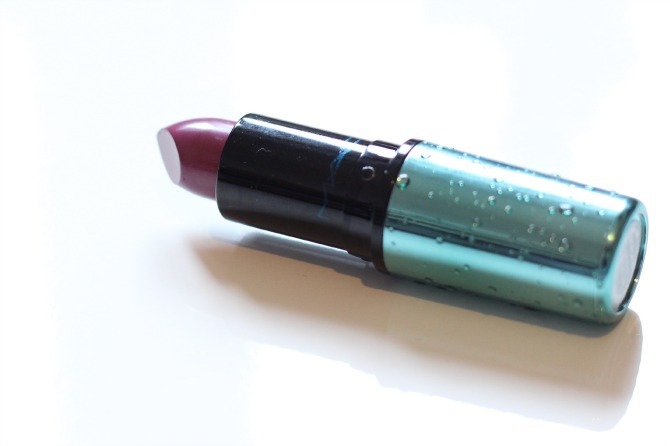 A couple weeks ago I saw a blogger share a picture of a lipstick they'd bought from the 'Alluring Aquatic' collection, and I honestly though she'd sprinkled water on it to make it more 'Aquatic' Oh how I was wrong! After seeing a couple of bloggers talk about the 3D droplet effects on the packaging, I was hooked! I had to go into MAC anyway to pick up some giveaway prizes and when I was there I saw the collection. They'd sold out of nearly all of it, apart from the lipstick shade I was most drawn to (Goddess of the sea). Goddess of the sea is a mauvy plum colour from their cremesheen range, so it's also fairly hydrating. It's not exactly a matte lipstick, but a fairly glossy one. This is only the 3rd MAC lipstick to make it into my collection (others being Rebel and Creme cup). I've only worn it a couple of times, but from when I have worn it, it lasts as well as other MAC lipsticks I've worn, and lasts best when applied with a lip brush (I find this true of all lipsticks), you get a nice defined line that way too. 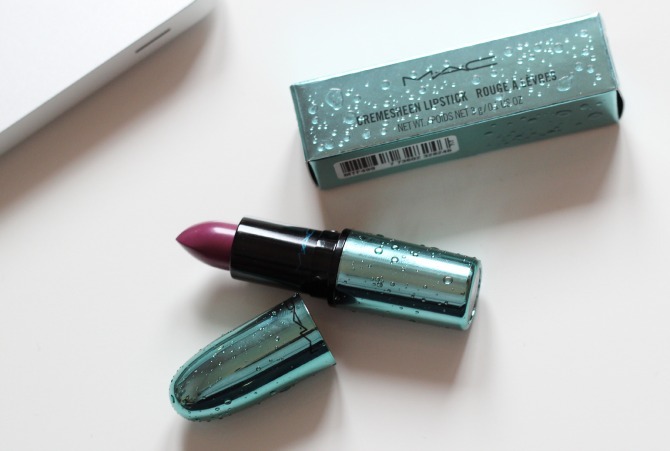 It also has that MAC lipstick smell that you find with all their other lippies, it's a lovely sweet scent. It's a beautiful lipstick in even-more beautiful packaging - this certainly won't be a piece making the chop when I have a clear-out ever, this is a dressing-table piece that I'll keep well beyond it's time to throw it away. The last few weeks have seen my first forray into the world of Nansy brushes. I've put them through their paces, trying them with lots of different looks, and the face brushes with different foundations and now's the time for me to tell you what I think. 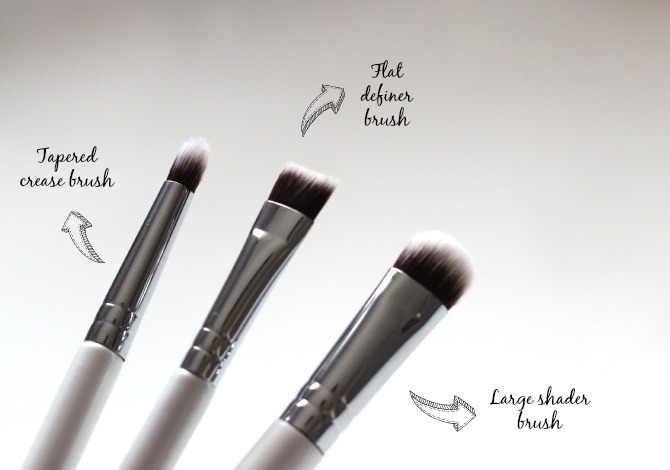 When Nanshy contacted me about reviewing these, it was after reading my post about my favourite makeup brushes, and how I raved about my Sigma F80 brush, they were wondering if I'd like to compare their flat top brush to it, and maybe a couple of others. Well, I don't like to turn down a challenge, especially if there's the chance I might discover a dupe! A couple of days after this discussion, my Nanshy brushes landed on my doorstep. The two brushes (to look at) are pretty much the exact same size and proportions, with the Nanshy brush bristles being ever so slightly longer. As a result, the Nanshy bristles aren't quite as tightly packed in - now this isn't a big difference, only a small one, but something I noticed when applying foundation. The Nanshy flat top brush blended in my foundation just as well as my Sigma, giving me a flawless finish to my foundation, working it into my pores and fine lines. 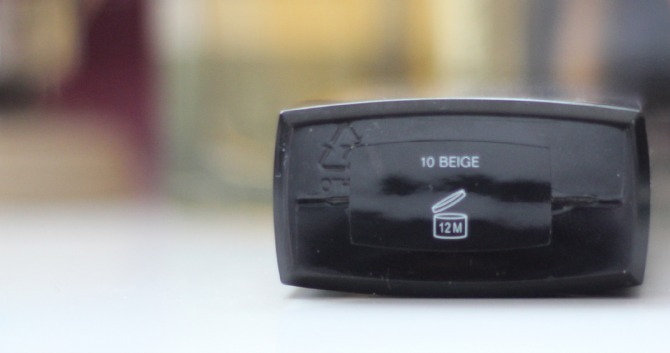 At £10.95* it's about £5 cheaper than the Sigma F80 too, making it a decent dupe. But which did I prefer? In all honesty, I still prefer my Sigma F80, not because there's anything wrong with the Nanshy one, but just because I prefer how the bristles are packed in with the Sigma (slightly tighter) which gives me the feeling of more control. Is it worth the extra £5? Probably not, but it's a personal choice and just a brush I tend to prefer the feeling of. How did I get on with the other brushes? 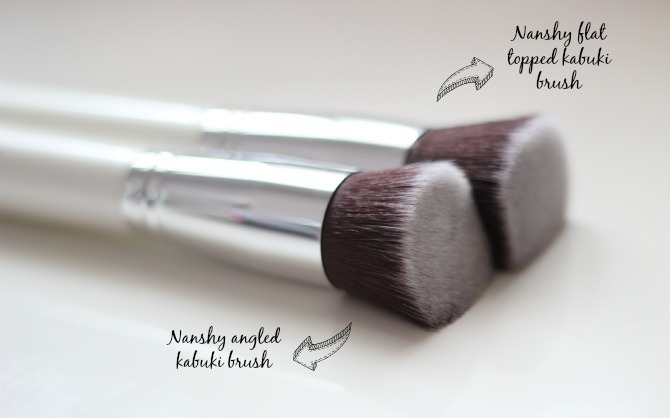 Nanshy angled flat top brush - this is as good as the normal flat top brush reviewed above, but with the added benefit that it works well to contour with too (if that's your thing). I found it was slightly easier to work with around the nose area and tricker parts of my face - a good decent brush. Nanshy tapered crease brush - I do really like this. Is it a replacement for my Bdelium tools crease brush? No, but it has a different use, the brush is smaller so better at defining. 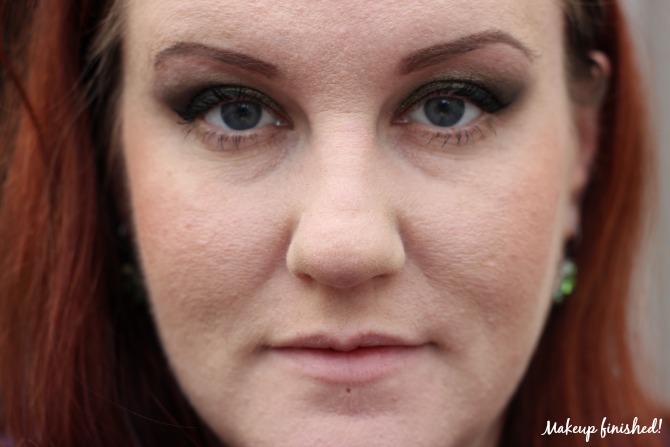 For me I reached for it to add some dark definition in the 'outer v' and blend in eye shadow under the eye if I was going for a smoky look - so yeah, it's not a replacement, but it's a great brush to have in addition. Large shader brush - great at packing on colour all over the lid, not great for detailed work, but that's fine as that isn't what you'd use it for :) If you're going for a look with 1 colour, or you need to add a good base colour to your lid then this will be great. I did find however that if I was using a very glittery eye shadow, some of the glitter gets lost in the bristles, but hey, this happens with lots of brushes! Flag definer brush - this is a brilliant brush - perfect for adding defined shadow under the eye, defining the 'outer v' or even if you're going to do a cut crease look, this would work well to segment the colour. If you're careful, you could also use this for your brows, but just use a dabbing motion otherwise you might get thicker brows than you want! All in all a great set of brushes, and set at prices that compete above their league. Yes, not every brush would replace my favourite but that's not say they're not great brushes - they're a great quality affordable alternative to some of the more popular or well-known ranges. You can find a selection of their brushes on Amazon, as well as some brush sets. 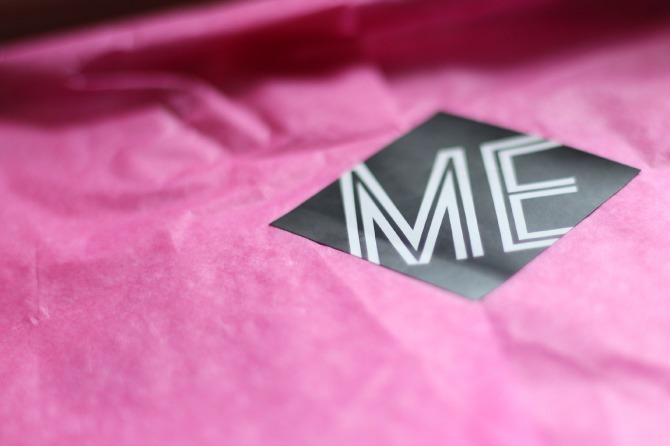 Welcome to my first ever Love me Beauty* box! 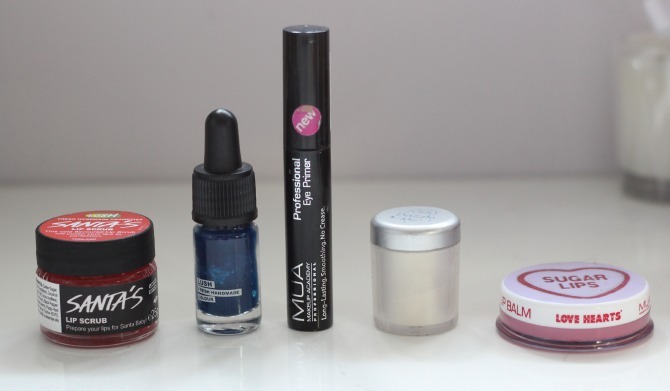 I was very excited when I was offered the chance to review one of these boxes - I've seen so many bloggers raving about them, and the boxes always looked filled with some really nice products. The 3 menu's were quite similar, I picked this one because it came with (in my opinion) the best flavour TeaPigs tea (Super Fruit). These are really gorgeous, and probably what I was most excited about in the box ;) I don't even think I can bring myself to use these, they do however look very nice next to my laptop :P These are the kind of notebooks that wouldn't be out of place in Paperchase or somewhere like that, that sells super lovely stationery. What a pretty shade! And when they say smudge proof they really mean it - I used Bioderma to get this off my hand and I had to scrub! I would imagine after a day of wear under my oily eyes it'll be a little easier to remove. It claims to be waterproof, and as much as I haven't tested this, it certainly wasn't easy to remove. It's a lovely natural shade perfect for day wear. I was really happy with this box - I can see me using everything in it, I'll be taking the tea into work! 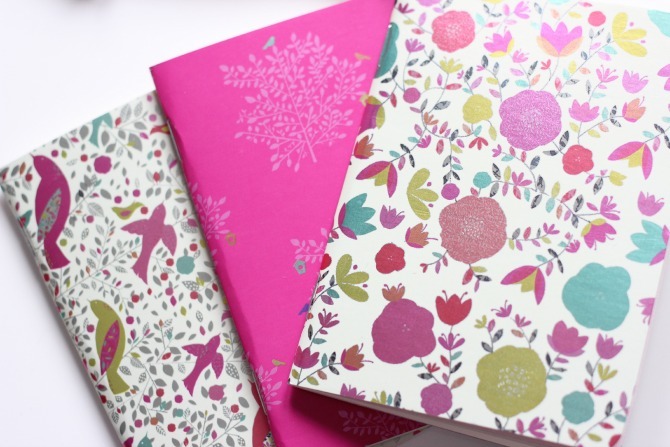 The stationery was my favourite part of the box just because it's so different, and they were so pretty. A really great box, thanks for giving me the opportunity to try it :) If you're interested in giving it a go, you can subscribe via their website here, the cost is £12.95 which isn't bad considering the value of this box was just over £30. They deliver to all of the UK and you can pay via PayPal or a credit or debit card. I've been in quite a reflective mood today, so I thought this would be the perfect post, and something more personal to share with you. During the next 15-20 years, you've learned a lot. You go through a lot of stress, some of which I can't possibly prepare you for, but there are things I've learned along the way that I don't want to you stress about. You eventually own a Mac and a DSLR :) Be patient, it takes a long time! Make an effort to learn to drive as soon as you can!!! I know some of these are more telling you things thats going to happen, but I don't want you to stress too much about them when they do. Some things, like deaths, no amount of preparing and knowing will ever make you ready for it, you just have to go through it, and come out the other side. I've been waiting to write this review for a while, my skin has gone from being great, to terrible and covered in eczema and slowly getting back to normal again. 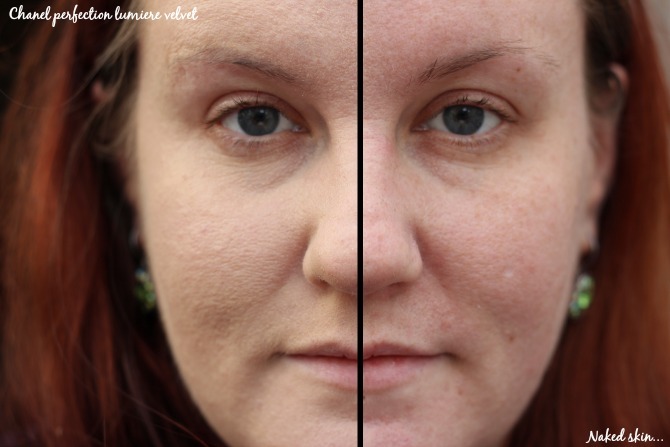 I thought the different phases of my ever-changing skin would be a great test for this, so I put it through it's paces! Wanna know how it performed? I'll get to that in a minute, first lets see what makes it tick. 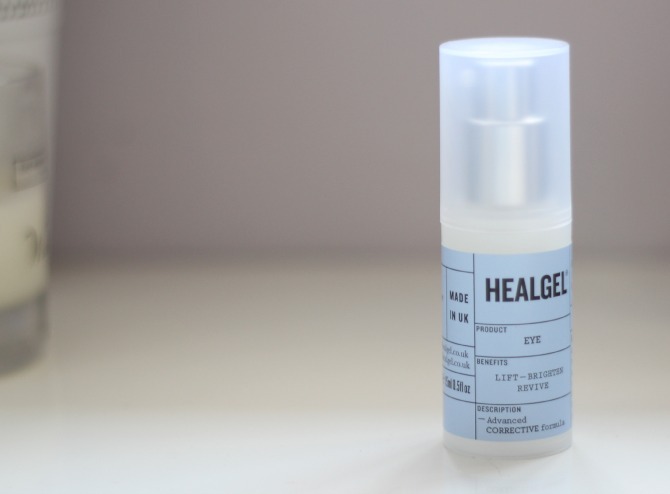 There's two main ingredients in HealGel Eye - Arnica and Madecassoside, I'll be honest, I've never heard of these before, but then I'm not all sciency. To cut out a lot of the confusing science talk, apparently they sooth (sounds good), and they boost the collagen in your skin - collagen is good for keeping elasticity in your skin (stopping you from looking older). Needless to say, this is focussed as an anti-ageing product. It also has a hyaluronic acid complex that apparently locks moisture deeper into the skin, who knew! How to use it: It can be used to help reduce the appearance of dark circles, as a refresher for your eyes, or as a base for your makeup. I don't have *that* much darkness under the eyes, so I can't say I noticed much of a difference there, but then there wasn't too much to correct, just a little blueness in the inner corner. However, what I did notice is how it would very effectively tighten the area around the eye. I'm not sure if this is how it reduces the appearance of wrinkles, but it worked well in that way for me. I don't have too many fine lines around my eyes, I'm quite lucky, but I do have some and some days they certainly look worse than others. Those are the days I reach for this, to help boost my skin when it's really lacking and it really does help, and noticeably. You only need the smallest amount, and it spreads really well, I always know if I've used too much, as the vapours from it I'll feel in my eyes, lol. Just blend it in with your ring finger, or dab with the same finger and it absorbs really quickly. All in all a fab product that's performed really well on my normal skin, and eczema ridden sensitive skin, I've been really pleased how consistent it's been and how well it's done under those conditions. 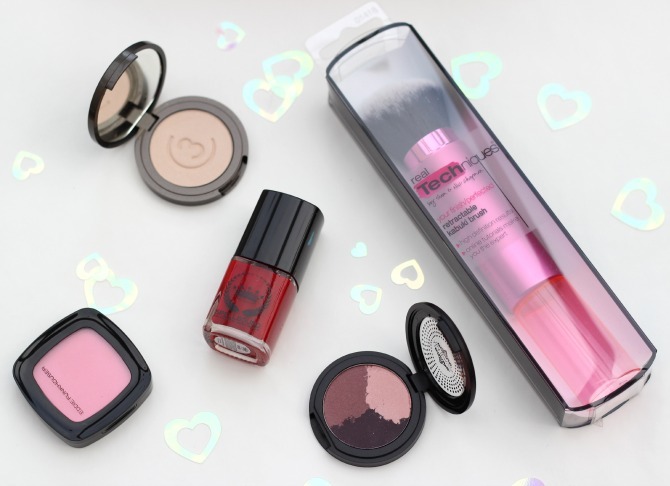 When I was having my big makeup clear out at the weekend, I discovered some products I loved, but don't wear enough, or haven't tried out enough to be able to review them, so this week I picked out a few pieces for me to 'shop the stash' with for the next week or two. Laura (A Scottish Lass) kindly brought this back from America with her last Nov time and apart from using it as soon as I got it, I haven't used it since, so I decided this needed some more love. It'll go really well with the purple GOSH forever shadow stick I've got (as the base) - oh yeah, I meant to tell you, after the success of the GOSH forever shadow stick I reviewed the other day, I decided to go out and buy a couple of others shades so I have a base of it to go with any shadow colour I decide to wear :D They were on offer for £3.50 in Superdrug, and buy 2 get 3rd free, BOOM! I picked this up a couple months ago when they launched in my local Next shop, I thought this looked really pretty, but I think I've only used it once and I'd like to review it, so I'm going to try and use this more over the coming weeks too. Literally bought this, loved it, used it for about 2 weeks and haven't used it in like 6 months. I tend to wear bronzer very rarely, so I'm going to try and make more of an effort with this one. I adore this and forget I have it. I love the packaging, this will be something I keep because it looks pretty, long after it should be thrown away :) It smells great too - looking forward to using this again as my setting powder. This is another gem Laura brought back from America for me that I haven't used enough, so out with my current blush rotation (MK blusher mostly) and in with this one! I bought this from their Autumn collection last year, it's very similar to their Fauve shade, but with less mauve in it. I actually had forgotten I'd bought this, I remember the quad I bought at the time, and started wearing it again recently, but forgot this - so it'll definitely be making an appearance on my lids once more. This is a bit of a multi-purpose product, you can use it as a base for your shadow, or as a liner - personally, I prefer it as a liner for under my eyes, it stays put really well, and it's like the darkest green (almost looks black) with flecks of green glitter in it. So that's my stash shopped for the next couple of weeks, what's your favourite piece from it? These are all going in the bin as I can't say I like any of them. I did try selling the MAC Dazzleglass but no one was interested - it's FAR too sticky for my liking! My Maybelline Colour Tattoo collection - all very old, they were all bought as soon a the range was released, and have gotten pretty try and hard to work with now. I still have one shade, Barely Beige from an American makeup swap, but I doubt I'd replace it with another. Most of these are too old to keep on using, and some are old and dry. 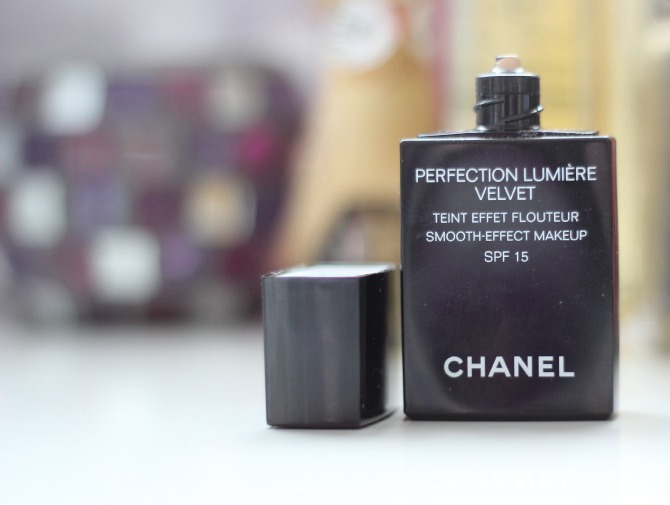 Didn't like the Superdrug B. foundation, my Rimmel wake me up has gotten a lot darker, the Chanel Le Blanc is VERY old, I bought it for getting married nearly 6 years ago! 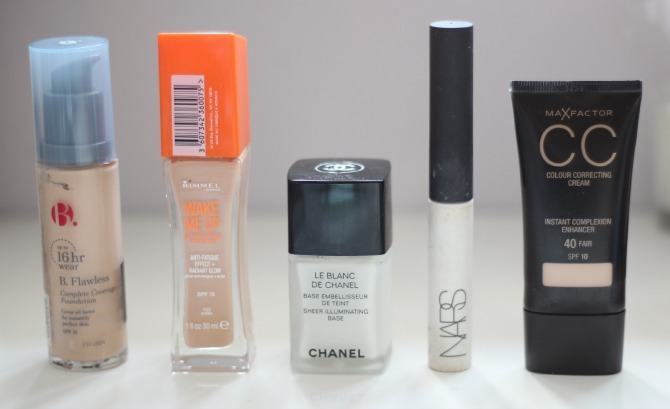 The NARS is more of an empty, and the Max Factor CC cream I hated (my face was sticky with it). 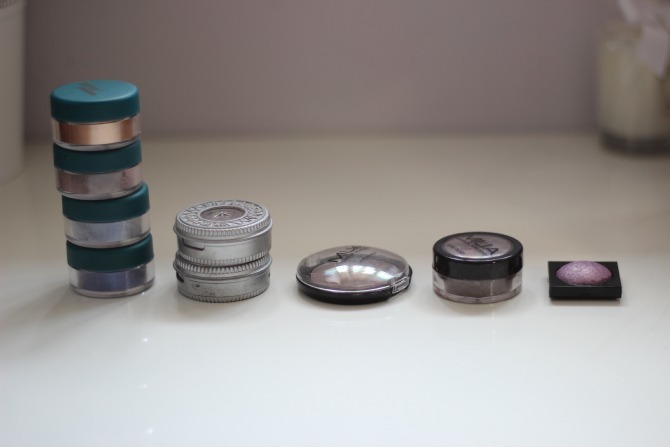 Some single eye shadows that are either old, or I don't like (the Urban Decay ones are VERY old). 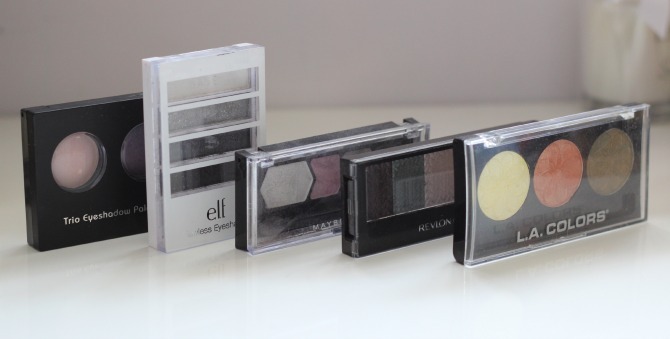 Very old gel eyeliners that I used enough to review, and never used again. Says a lot really eh? 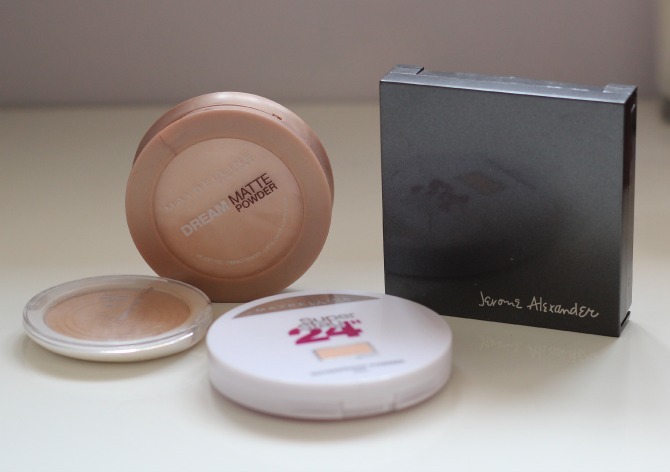 Face powders I shouldn't have bought - the two maybelline ones are far too dark for me, the Elf one is too, and the Jerome Alexander magic minerals is over 2 years old now. 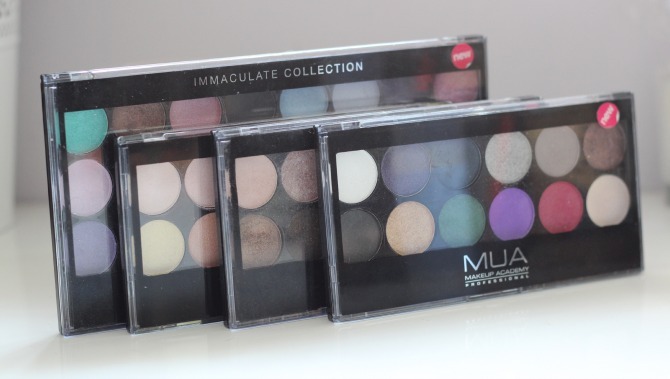 Old MUA palettes - had these for a long time - didn't see the need to keep the 'Undressed' palette as I now own an Urban Decay naked palette which is better in quality. Old trios and quads - the far left (VIVO) one is bad quality, wasn't keen on the Elf one, the other three are just too old. 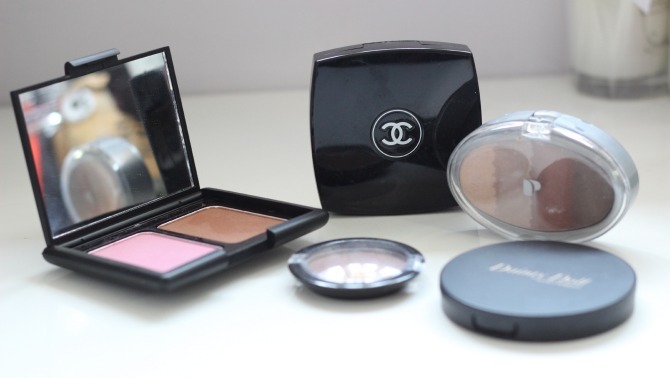 Broke my heart binning that Chanel quad - but it must be like 8 years old, I haven't used it in years. 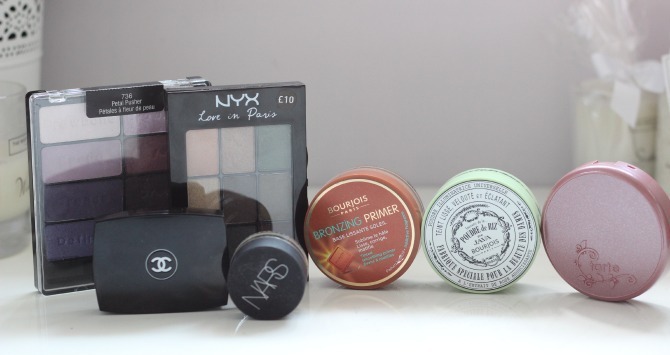 The others are products that I didn't get on with (the Elf contour is ok, it's just too glittery for me). 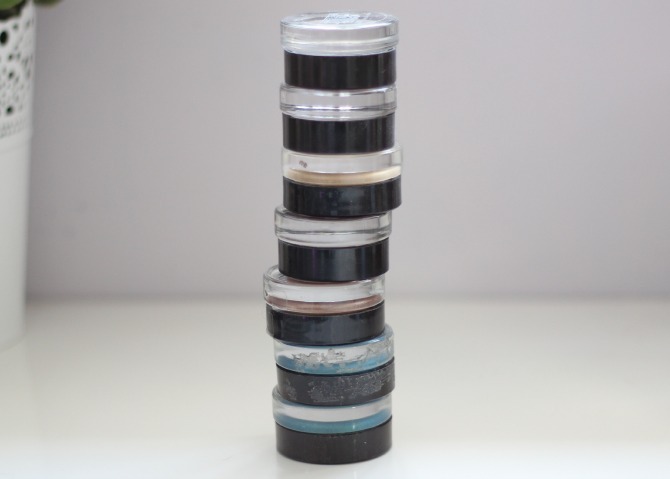 The Urban Decay eye shadow stick... 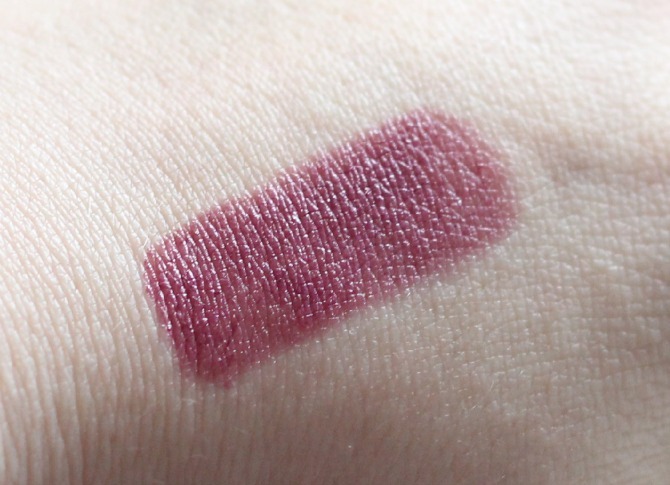 I wanted to love this so much, but it creased on my like crazy, and it's really old, the Mally shadow stick I won on a Twitter giveaway a blogger was doing - she said it was new, but alas when it came it was used... the other two shadows I bought for a makeup job I was doing, and they're not colours I'd wear. Every now and then I have a big clear out of my makeup. Well, now that we have a baby on the way, we'll be losing our spare room to turn it into a nursery, and my makeup collection will be moving with me into the bedroom, which means I won't have enough room for about half of my makeup. So, yesterday I began the process of starting to *nest* and sort out my makeup. 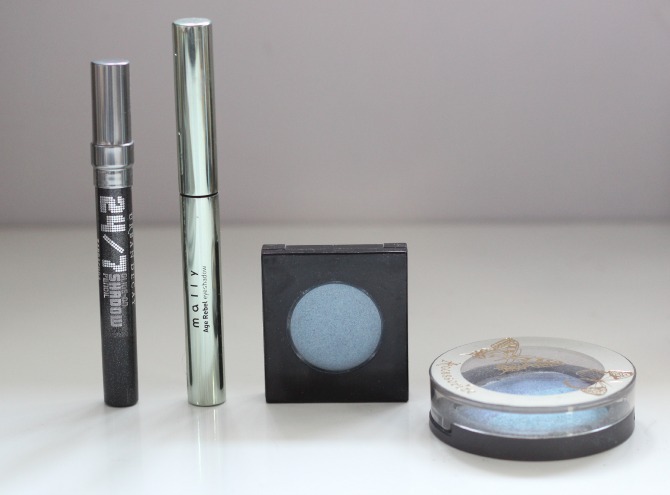 Over the last couple of months I've been leaning towards using the same makeup most days, and whilst I don't like to do that, it has made me realise all the things I have that I don't want or use. 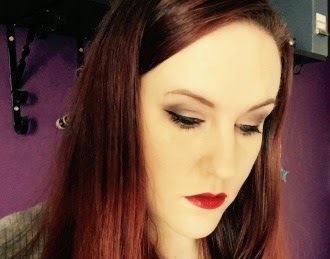 So I began with throwing out makeup that was too old to use, some of it was really old (years) and some was possibly still in a useable age (within 2 years) but getting close to that cut off, and it wasn't makeup I'd used in that time or could see myself using again. A couple of items were just ones I really didn't like and decided it was time to get rid of them, as I wasn't going to wear them again. A few others were ones I'd tried selling in a previous blog sale, but didn't sell. When I posted pics of these on Facebook and Twitter (everything grouped together marked as 'bin') I had quite a few comments about why I was binning them - but considering I no longer have room for all of them, and how 90% of them were too old to use, I didn't see it as a big deal. I know when you see it all together it looks quite shocking, I've never thrown out this much makeup in one go before, but it needed to be done. 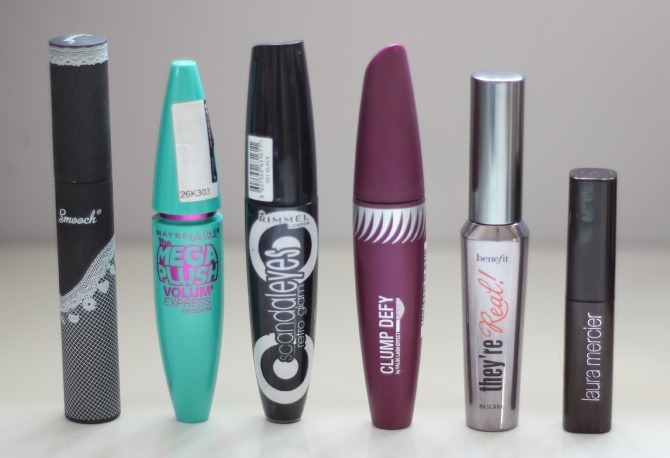 I've also had conjunctivitis from wearing makeup that's too old back when I was about 18/19, I had no idea it went off - at that point I threw away all my makeup and bought a few new pieces, something you should always do if you get an eye or skin infection. 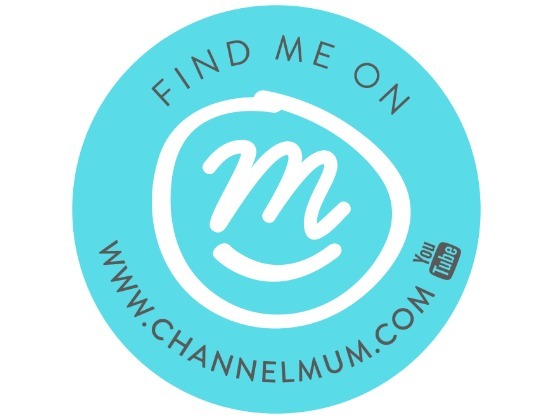 Hope you've enjoyed this post, when was your last clear out? Happy Friday :) I thought I'd break the pace of beauty reviews and do something a little different today, I thought I'd write about all the things I'm looking forward to this year. If you've been reading my blog for the past few months, you'll know my year got off to a horrific start - I won't regurgitate it all now, but if you want to read about it before you carry on, here it is. After that horrible start to the year, our worlds got turned upside down once more, but in a wonderful way. 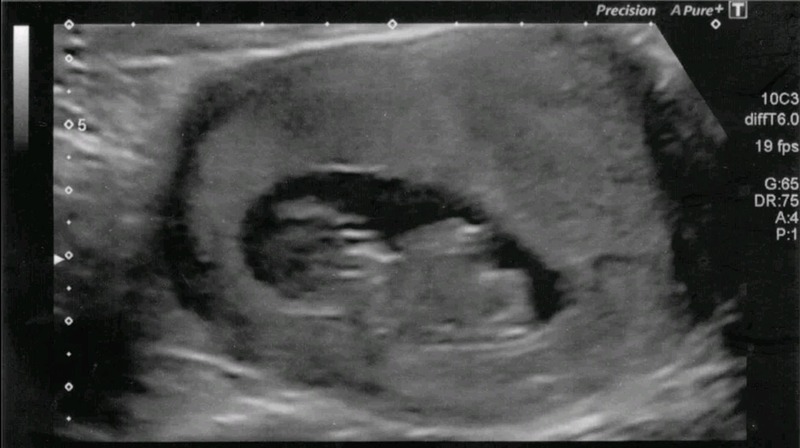 I found out that I was pregnant and we were expecting our first baby - I honestly couldn't be happier (well, if certain people in my life were still here, that would make me happier, but I'm a realist and that's not possible). Hubby and I had been trying for about 8 months and had pretty much given up hope. Well, now that I'm 18 weeks pregnant, nearly 19, I'm out of the scary woods and looking forward to a wonderful year. This month I'm hoping to start learning to drive, properly. The hubby took me out a couple of times in early Jan, but I think he was a bit nervous in our nice car (a snazzy Honda Civic) without it having dual controls. Now that I'm preggers, I want to pass my test while I can still fit behind the wheel, if possible. Also this month I have my 20 week scan (on the 27th), we'll find out if everything is ok with Squidge, and if they're a boy or a girl (as long as they're not hiding their bits) - this can't come soon enough! I'm looking forward to having a nice Summer with my hubby before the baby comes. Once his exam is done in early June (he's doing an OU degree), he'll have 3-4 months off - this is when project baby prep gets underway and we get the house ready for our new arrival - very exciting stuff! I'm hoping we can spend some long evenings on the decking just relaxing and spending quality time together. We're also hoping to go away for a long weekend together, but I'm not sure we'll be able to afford this, I think we'll need to save all our extra pennies for £600+ a month we'll be losing when I'm on maternity leave... don't ask how we're going to cope, I'm still trying to figure that out! This is a special time of year, our baby is due 13th October, so obviously looking forward to that and everything that follows. Autumn is my favourite time of year anyway, the lovely leaves falling off the trees, the cooler weather and the Earth beginning to hibernate ready for winter (needless to say, Autumn is a totally plausible name if we have a girl). I thought it would be nice to post something personal, and much more positive than my previous personal posts this year! It's taken me forever to get around to writing this, but I was also late to the party (typical me!). I picked this up in Superdrug about a month ago and thought I'd give it a go. 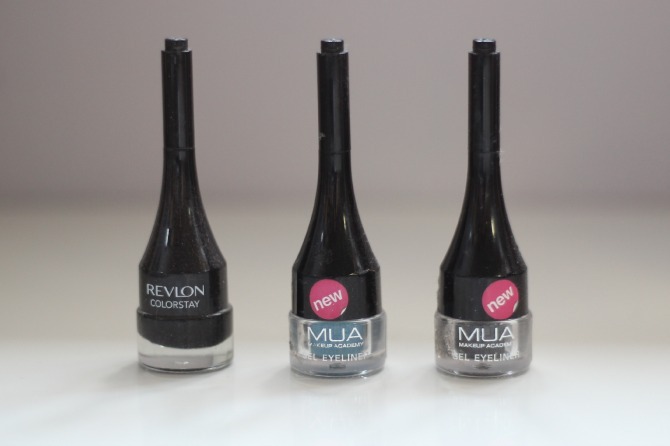 I wanted a nail polish remover I could keep in my bag, that was hassle free and easy to use. Inside this pot is a dark grey sponge, which is soaked in nail polish remover, and sweet almond oil. 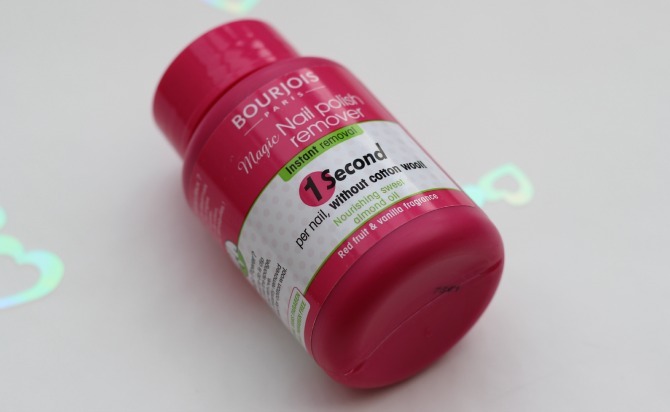 Now, it claims it removes the polish in 1 second, this isn't true, but it does remove it really quickly! Definitely more quickly than if I was doing it the traditional way. 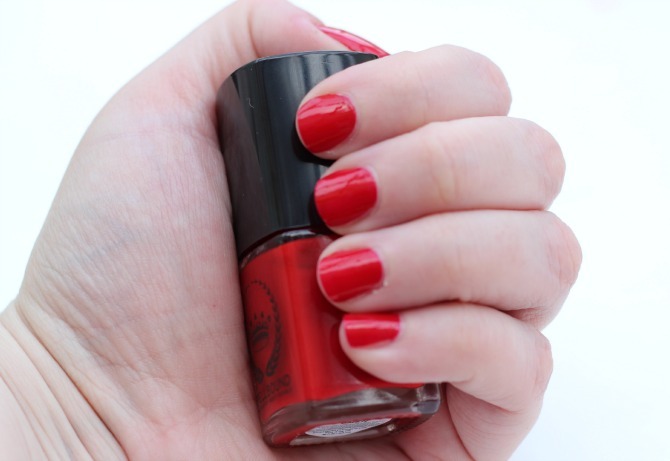 With heindsight, I should really have taken pics of me removing my nail polish, so I'm afraid you'll just have to take my word :) With a normal cream shade, it takes about 5-10 seconds per nail realistically. With glitter, it takes a bit longer and more effort, but it does remove it. One of my favourite things about this is the lovely scent it gives my nails & finger tips once the polish has been removed, it's the 'red fruit & vanilla' they've added to it - however, it does leave my fingers feeling oily, so I always wash my hands straight after using this, which usually gets rid of that lovely scent too, bummer. The price-point of this isn't great, it's just over £5, which when you compare that to a pack of cotton wool and some standard nail polish remover, is around £2 more expensive, but even saying that, I think it's worth it. It's much more hassle free, it's quicker and it's convenient. It easily fits in my bag so if my nails are chipping left, right and centre when I'm out and about, in the space of about 1 minute, I can have all the nail polish taken off all my nails - that's pretty good! The only downside really, is that after maybe 5-10 uses, the sponge inside does start breaking apart a little, I noticed tiny pieces of sponge on my fingers when I was removing them, but this didn't bother me as I was going to wash my hands anyway. 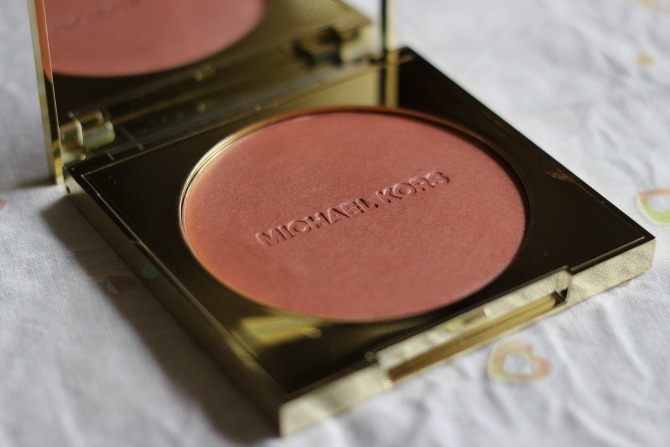 To call this a bronzer, doesn't feel quite right , it's pink, and most definitely a blusher, but it's part of the Michael Kors bronzer capsule collection. 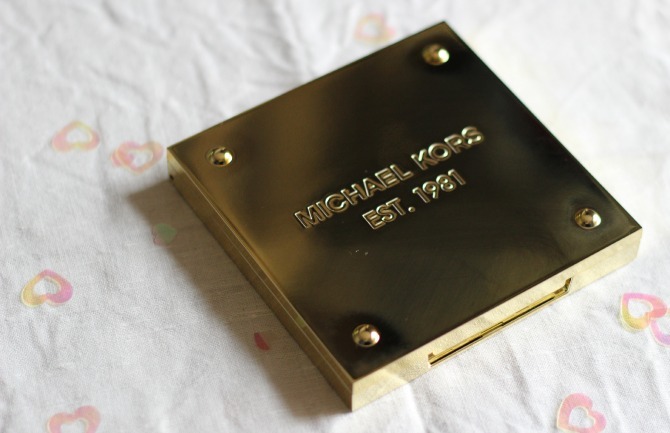 In all of the Michael Kors makeup I've tried, this is probably my favourite. The quality is amazing. Now don't get me wrong, I like Sleek blushers, but one touch of a brush in the product and you already have too much - personally, I prefer a firmer product, one I can swoosh my brush around without picking up too much. Chanel is like that. I adore the packaging on this too, it's elegant, sturdy, classy and simple, just utterly gorgeous. It's an absolute dream to work with, it doesn't splodge it all out on your cheek and make you look patchy, it works into a soft glow, and while my pictures my not do it justice, it really is a beautiful shade, one I've been wearing almost every time I've worn makeup for the last month. Another month, and that means another wonderful Wantable makeup box*. 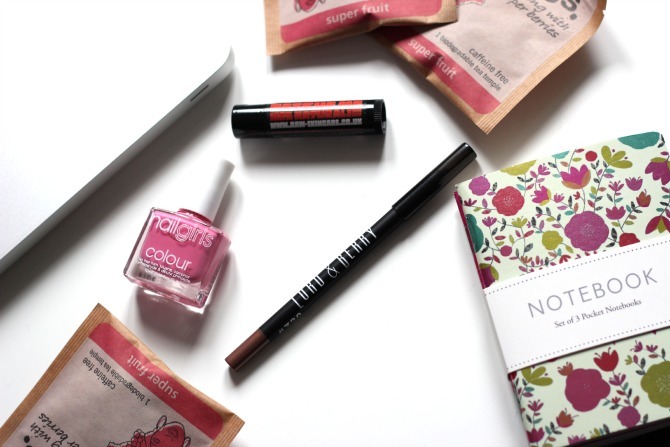 The UK beauty boxes pale into comparison compared to this, every month I feel like there's great products, after great products and this month is no exception. This box was put together by Teresa Sammarco, she's the in-house beauty editor for Wantable. This I was really excited to see in there, you can ask my hubby, I gasped with excitement when I saw this! It was nice to see a brand I was familiar with. It's lovely to be introduced to all these new brands, but a bit of familiarity now and then is great too. This is something I haven't tried and will be perfect for my makeup bag for on-the-go. The total value of this box (in dollars) adds up to be $79.99, which at the current exchange rate works out to be £47.49. 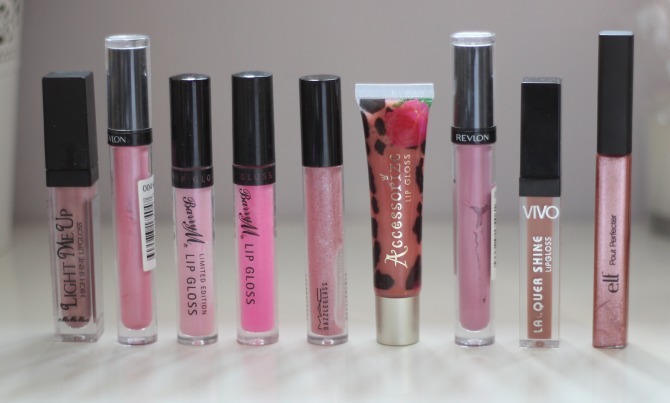 These are all full size products, not sample size. For a one-off subscription, it's $36 which at the current exchange rate works out to be around £21 - not bad for the value of the box :) All in all I'm really impressed with this box, I love it and can't wait to do my makeup in the morning to use it all! Certainly more impressed with this than I am the recent Birchboxes (which I've just cancelled). If you're interested in subscribing to Wantable, you can subscribe here, for more information, visit their site here. 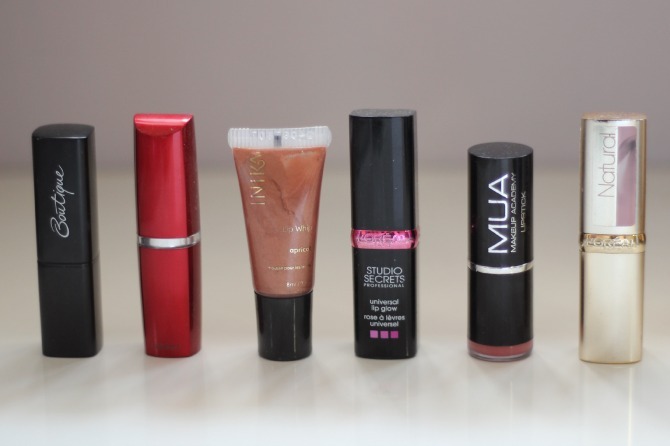 I'm always on the lookout for a new, fab foundation, one that I'll reach for day in, day out. Well, after seeing a couple of reviews about this, I was intrigued. I have the vitalumiere aqua which I really love, however, thanks to my oily skin, it does have a tendency to slide off my face (trust me, not a good look). I decided to pick this up as a birthday treat to myself the day after my birthday (18th April), so I've had enough time to put it through it's paces and see how it copes on my skin. As I mentioned, I have really oily skin - what I mean by that, is a very ,very oily t-zone, and dry patches on my cheeks, so that doesn't make me the perfect candidate for this foundation, but does that stop me loving it? Hell no! As you can see, I have the lightest shade 10 beige, the woman in the shop really tried to get me to buy a darker one (why, I've no idea). When I pointed to my neck and chest to show that this was the right colour match for me, she replied with 'Well, yes, it'll be a perfect match, but don't you want to add some colour, you're very pale'.... this is the story of my life when dealing with counter staff. It's like they hate people who are pale and want to fake darken them all up! I feel like yelling "Leave me the hell alone!!!!" I did tell her that I like rocking the pale look, and she seemed to shut up then. As it turns out, this is still ever so slightly too dark for me, I have to blend it down my neck so it doesn't look too obvious. It is yellow-toned as well, which suits me perfectly, pink-toned foundations do not look good on me. This lasts really well through out the day, I know I don't need to keep re-checking it and certainly don't need to re-apply. It has a true velvety finish, and it doesn't make me shiny. If you have any dry patches on your skin, just make sure you moisturise first otherwise, this might not look amazing on you :) All in all, I really love this foundation, it's pretty much the only one I've worn in the last few weeks (excluding my eczema-yestocucumbers-enduced skin rage where I couldn't wear any). 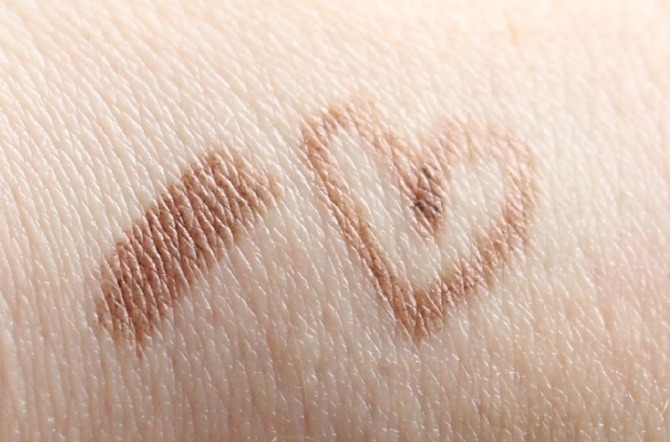 It looks flawless on my skin, has a lovely matte finish and stays put all day without looking cakey. You really need to moisturise before you use this if you have any dryness on your skin, otherwise it will emphasise those patches.